Items seized by Atherton police this morning (Feb. 2) from a man parked in the 300 block of Atherton Avenue. Atherton police photo. 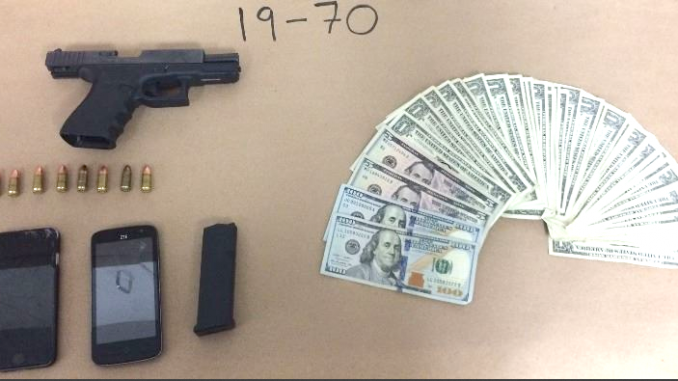 Atherton police, who were on patrol for home burglars early this morning (Feb. 2), arrested a Modesto man who was in possession of a loaded gun and a large quantity of cash. They found the man in a “suspicious vehicle” parked in the 300 block of Atherton Avenue at about 2 a.m.
Arrested was Devert Welch, 26. Police booked him into jail on charges of possession of a loaded firearm and possession of a concealed firearm in a public place. Due to a rash of burglaries, police have stepped up their patrols in Atherton. The Daily Post reported this morning (Saturday, Feb. 2) that during a town hall meeting on the break-ins, burglars broke into a home in the 1-99 block of Santiago Avenue. At the time, the town’s top police officials were answering questions at the meeting Thursday night at Holbrook Palmer Park Pavilion. About an hour into the meeting, at 8:30 p.m., burglars smashed a second-story balcony glass door and entered the Santiago Avenue home. The burglars tripped the home’s alarm but patrol officers were delayed because they were responding to a smoke alarm elsewhere in town. Police said they believe that the burglary was likely done by one of the same groups of burglars that have been hitting the town recently. Thursday night’s meeting was called after the town saw an unusual spike in crime on Monday night, when four cars were rummaged through, one home was burglarized and a car was stolen. Additionally, it was discovered that sometime between Jan. 25 and Monday, a home on the 1-99 block of James Avenue was burglarized, with about $10,000 in purses stolen. Also on Jan. 25, three people smashed an upstairs window of a home on the 100 block of Tuscaloosa Avenue, stealing about $5,000 worth of jewelry. As far as protecting your home, Chief Steve McCulley on Thursday asked that people continue to call police if they see anything suspicious in their neighborhood. McCulley also suggested that residents look into upgrading their alarm system, after some mentioned at the meeting that they don’t turn their motion sensors on because of their pets. The chief said there are some alarm systems that allow you to set a minimum weight limit for your motion sensor. For example, if your dog weighs 30 pounds, you can set it so anything that weighs more than 35 pounds triggers the alarm. He also reminded people to set their alarms and lock their doors and cars. In many of the crimes that occurred recently, people’s alarms were not on or their motion sensors were off. Residents can also sign up for the town’s email subscription service at https://bit.ly/2BduckG and get news flashes from the city’s departments. More tips from the town’s police department can be found at https://bit.ly/2SgEXN0. Large amount of cash? Looks like about $243 bucks to me. In Atherton, $243 is nothing. It’s the tip you give your gardener or housekeeper. $243 is the cost to manicure just one finger at the typical Atherton nail salon! The whole hand will cost $1215. If you want both hands done, that will run you $2430.